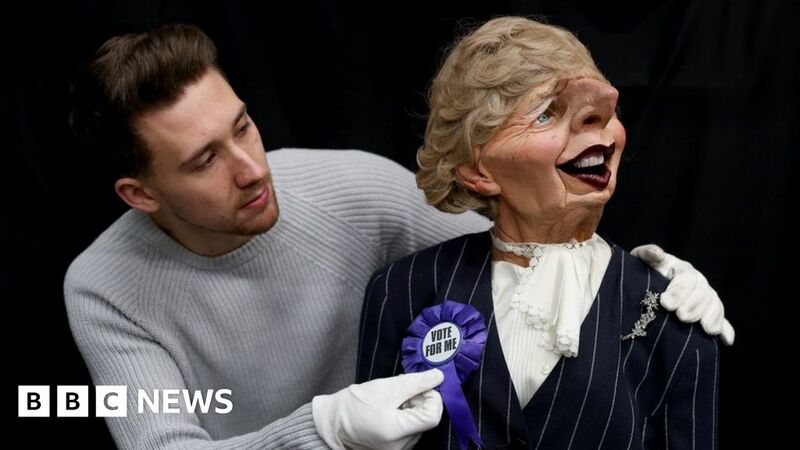 A Spitting Image puppet of former prime minister Margaret Thatcher is expected to fetch £3,000 at auction. The unflattering prop – which featured in the satirical 1980s TV programme – shows her wearing a rosette asking for votes. Bidding began on Wednesday. Baroness Thatcher’s puppet is one of 41 being sold by movie memorabilia specialist Prop Store, based in Rickmansworth, Hertfordshire. Chief executive Stephen Lane said he was “thrilled” to put on the auction. Spitting Image, which ran for 12 years from 1984, was renowned for lampooning celebrities, politicians and the royals. Other puppets being auctioned include Tom Hanks, Salman Rushdie, Robbie Coltrane and Boy George. Baroness Thatcher’s son Mark and husband Denis are also up for grabs, with bids starting from just £25. Mr Lane said the auction had a “fantastic selection” of puppets from the “legendary” television series. Bids are being accepted online until 28 February.